Lawndale Christian Health Center (LCHC) is celebrating the opening of its new Health and Fitness Center, a state-of-the-art facility providing a safe and inviting public space for fitness, nutrition and medical care in the heart of Chicago’s Lawndale neighborhood. 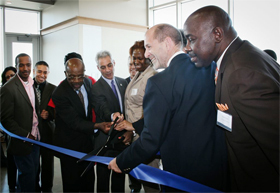 Mayor Rahm Emanuel participated in a ribbon-cutting ceremony last week at the Center, alongside local, state and federal officials, as well as staff and supporters of LCHC. LCHC, 3750 W. Ogden, recently completed 60,000-square-foot Health and Fitness Center that represents LCHC’s commitment to delivering high-quality medical care, while also facilitating wellness and community-building. The Center’s fitness areas feature an indoor track, more than 100 cardio and strength machines, group fitness and youth exercise classes, as well as free, personalized exercise and weight loss programs. An affordable rate structure gives guests the option of joining the Center on a monthly membership basis as a family or individual, or on a daily use basis.